Just how much does Brazosport College ask for tuition at this time, and how much is tuition predicted to change? How do these charges contrast with other schools? Keep reading to find out. Prepare economically for your education. Compare Brazosport College's tuition and fees to other U.S. colleges and universities. Check for tuition trends and potential increases to find out if you have to allocate more money for the next 4-6 years of college bills. How Does Brazosport College Contrast With Other Schools? The next table outlines how Brazosport College measures up to other schools nationally, regionally and by state. Brazosport College tuition and fees is lowered significantly for residents of Texas. For in-state students, tuition and fees is set at $3,735 for the 2017 - 2018 year, 30.3% off the price charged to out-of-state students. Tuition is $2,970 and fees $765. Students from the local district receive an even bigger price cut. Local district fees and tuition were set at $2,715 with $1,950 being tuition costs, and $765 being fees. Locals get 49.3% off full price over students from out of state. Brazosport College out-of-state undergrads paid $5,355 in fees and tuition in 2017 - 2018. $765 was charged for fees, and $4,590 was charged for tuition. View the table below to see 2017 - 2018 academic year costs. View Brazosport College cost per credit hour here. 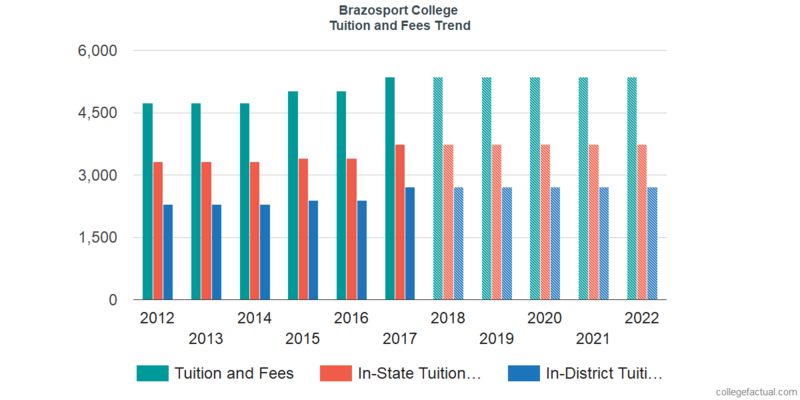 Brazosport College tuition and fees have remained stable for the past five years. We anticipate the cost of fees and tuition for this year will total $5,355. If tuition charges remain constant, two years at this school will run you $10,710 and four years will run you $21,420. Furthermore, you may have added costs for room and board, transportation, and books. See the following chart to discern how Brazosport College fees and tuition may develop including residence based discounts in the future. Be aware of how much college fees and tuition is rising every year. At many schools undergrads will end up spending more money on their final year of college than they did for their first.